Growing up, my mother used to tell me that “sometimes the hardest thing to do is the right thing.” I have found truth and wisdom in this message at different points throughout my life yet have always struggled with it – wishing it weren’t true somehow and wanting it to be easier to the right thing. I found this to be the case just this week when faced with a difficult decision in which I knew what the right thing was and yet somehow wanted it not to be so hard. I worry that people reading this post may get caught up on the word “right” so to clarify – for me this isn’t about right or wrong in the black and white sense but rather by “right” I mean making the choice that fits with my personal values and goals. Oftentimes, this isn’t the easy choice for a myriad of reasons . . .
One of the reasons making the “right” choice can be hard is that when we follow our dreams, our goals, our values – it may bring up a lot of difficult emotions, such as fear, anxiety, or guilt. It may also bring up a lot of unhelpful or critical thoughts, such as “What if I fail?”, “I’m not good enough”, or “I’m not worthy.” These are just examples of some of the emotions and thoughts you might experience when you pursue something meaningful and important to you. The truth is it takes courage to follow your dreams – it’s not an easy thing to do and it’s a natural response for our “alarm bells” to go off when we are doing so. When we move in the direction of something that is important to us, we are opening ourselves up to risk, vulnerability, and potential loss. If it wasn’t important to us, we wouldn’t feel afraid or anxious. It’s like upping the ante in a game of poker, there’s more at stake if we lose. I have oftentimes struggled with the fear of failure in my life and, at times, this fear has stopped me from pursuing something that was important or meaningful to me. What I’ve learned and support my clients in practicing is that we can feel afraid and still move in the direction that is meaningful and congruent with our values and goals. I realize now that is what my mother was telling me all those years ago, that doing the “right” thing is often the hardest thing to do because it brings up fear, worry, anxiety, sadness, self-doubt, (fill in the blank), . . . and those difficult emotions and thoughts don’t have to stop you in your tracks. It was her way of validating that just because something was difficult, doesn’t mean it wasn’t “right”. 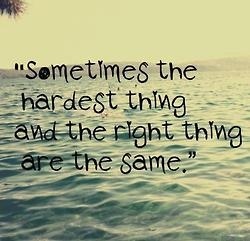 I’m curious, have you found that “sometimes the hardest thing and the right thing are the same”? 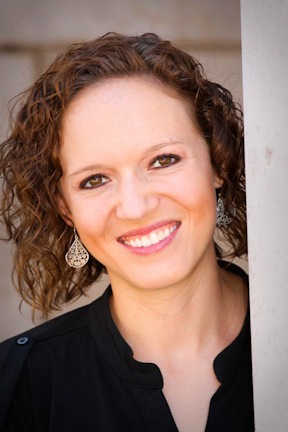 Catherine S. Tilford, MA, NCC offers individual, couples, and group therapy services in Westminster, CO and specializes in eating disorders and disordered eating, body image, depression, anxiety, and personal growth. Please feel free to contact me with any questions or to schedule an appointment. Yes and I’ve only realised this as I’ve gotten older (almost 30) after many years of putting others feelings first and being scared to do what’s right I’ve finally realised that it’s okay to do what’s right for me, even if it’s hard and painful for myself and others.